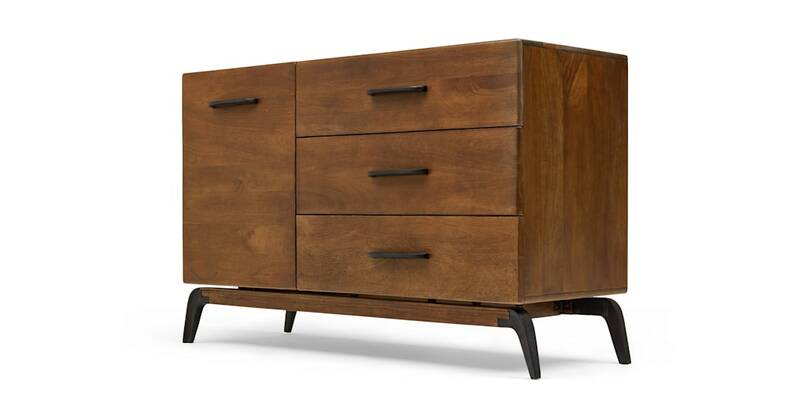 Meet Lucien, our mango wood sideboard that’s an instant classic. Not only is it a great looking, sturdy piece, it features two roomy drawers plus cupboard space, so it’s perfect for boosting storage. This sideboard is ideal for those who enjoy the finer things thanks to its quality construction and use of luxe materials. It’s crafted from solid mango wood and finished with cast aluminium legs, lending this piece a modern industrial appeal. It’s the work of celebrated British designer, Tim Fenby. We love the way he perfectly balances practical concerns with brilliant design. Kicking off his design career working for his family’s interiors business, Tim Fenby launched his own design consultancy over a decade ago. He identified with the MADE.COM philosophy of original, direct design and what started as a dining collaboration now includes bedroom and hallway options in various finishes. So, you can find your perfect Fenby piece.